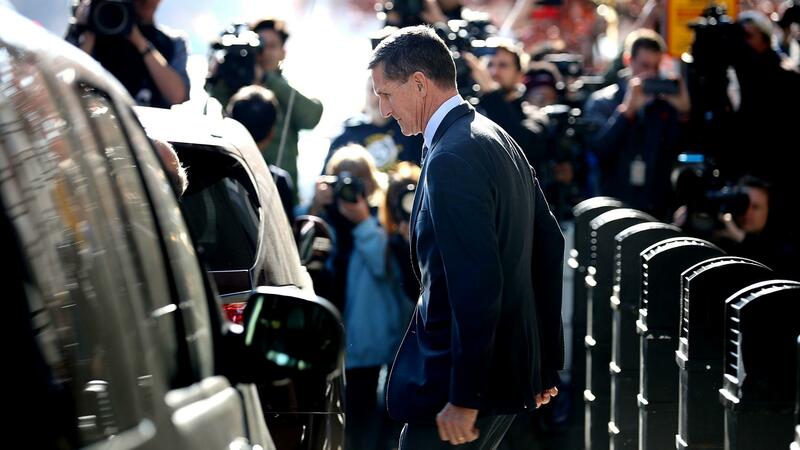 Michael Flynn, former national security adviser to President Trump, leaves following his plea hearing at the Prettyman Federal Courthouse in Washington, D.C., last December. As reporters and lawyers for President Trump speculate about the end of the investigation into Russian interference in the 2016 election, the special counsel threw a curveball this week. In sentencing documents for former White House national security adviser Michael Flynn, authorities reported that Flynn had offered "substantial" and "firsthand" assistance with not only the Russia probe, but also an unspecified ongoing criminal investigation — and, possibly, another matter. Defendants typically get credit for that sort of cooperation when they are sentenced. But the memo by prosecutors Brandon Van Grack and Zainab Ahmad suggested that "some of that benefit may not be fully realized at this time because the investigations in which he has provided assistance are ongoing." That news, combined with the disclosure that Flynn had met with government investigators 19 times in the past year, set off a new and frenetic round of guessing about what mysterious other areas the special counsel and others at the Justice Department are examining. "Nineteen meetings, that's an awful lot of meetings," said Peter Zeidenberg, a former federal prosecutor and member of the special counsel team that investigated the leak of a CIA operative's identity in the George W. Bush administration. "Look, common sense tells you that Flynn is going to know a great deal of information that's of interest to Mueller. His closeness to Trump and the campaign and the convention ... if there's collusion, those are the kinds of things that are going to be of great interest." Herewith is a partial list of the possibilities. Zeidenberg and others raised the prospect that authorities are looking into how the Trump campaign, and now the Trump administration, has been handling demands from Turkey to transport an elderly cleric from his home in Pennsylvania and into the hands of the Turkish regime, which views him as an enemy. The departments of Justice and State have raised questions about whether there's a legitimate legal basis tying the cleric, Fethullah Gulen, to any illegal activity in Turkey. Flynn already has acknowledged lying about his contacts with Turkey, including paid advocacy about the cleric's "removal" from the United States, that he failed to report to the Justice Department. "It's much, much harder to suss out what's going on here than in a normal white-collar case," said Samuel Buell, a former federal prosecutor who now teaches at Duke University School of Law. Buell said if Flynn had offered truly bombshell testimony, "I think there probably would have been more charges to begin with." Instead, he said, Flynn pleaded guilty to one false-statements charge. Others have suggested Flynn may have information to share about the inner workings of the transition as its point man to Russia, perhaps including financing of the campaign or the inauguration. Support for this view comes via a question in last summer's trial of former Trump campaign chairman Paul Manafort. Manafort's lawyer, Kevin Downing, pressed deputy campaign chairman Rick Gates about whether he billed the inaugural committee for some of his personal expenses. Downing asked whether Gates had been interviewed by the special counsel about his role in the campaign. Prosecutors swiftly objected, and the judge called both sides to the bench for a private conference about the issue. It did not come up again in the trial. But news reports have suggested that a number of Russians with connections to the Kremlin may have funneled money into the campaign or the inaugural celebrations in early 2017. A number of oligarchs who attended those functions have been questioned by the FBI about them, during travel layovers inside the United States. It's illegal for foreign contributors to donate to inaugural committees. Mary McCord spent more than 20 years at the Justice Department, resigning last year as chief of its National Security Division. She declined to address the nature of the information Flynn had provided authorities. But she added that whatever Flynn had told prosecutors, they seem to have bought it. "The sentencing memorandum arguing that a sentence of no jail time is 'appropriate and warranted' indicates that the special counsel found Michael Flynn to be forthcoming, credible and of substantial assistance to the special counsel's investigation," said McCord, who now teaches at Georgetown Law Center. "I would not expect to see this kind of recommendation if Flynn had been reticent or was suspected of withholding information, or if the information he provided was not helpful to furthering the investigation." Flynn's lawyers, Robert Kelner and Stephen Anthony, have consistently declined to comment about him over the past year. But they're expected to break their silence Dec. 11, when they file their own brief urging the judge not to impose a prison sentence on the 33-year military veteran. Flynn is scheduled to be sentenced on Dec. 18.